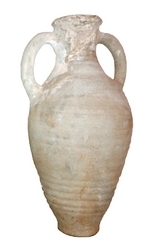 A short flat-based amphora type. Longish cylindrical neck with a triangular to flanged rim which has a small ledge running around the inside of the vessel immediately below the lip. The handles are oval in section and join from the upper shoulder to just below the rim. The shoulder is hemispherical and the rilled body leads to a flat base. Examples of these amphorae have been found to bear a stamp in the form of a menorah (Pacetti, 1998: Fig. 8.4), while one example from Rome was stamped [..] REG (Saguì, 1998: Fig.11.7). Around the middle of the fourth to the seventh centuries AD (Saguì, 1998). The principal source seems to be southern Calabria (Arthur, 1989), where kilns have been found at Pellaro and Lazzaro, although they may also have been made at Naxos in eastern Sicily (Saguì, 1998; Panella, 2002). Widely distributed in southern Italy, but is also present at Rome and particularly in the north-western sector of the Mediterranean (Marseilles and Tarragona), as well as in north Africa and occasionally in the eastern Mediterranean (Athens) (Bonifay & Villedieu, 1989; Sciallano & Sibella, 1991; Reynolds, 1995; Pacetti 1998; Saguì, 1998; Arena et alii, 2001; Panella, 2002). Gas-chromatographic studies have revealed the presence of wine residues.